In our work lives, we all try to project the most positive image of ourselves. Sometimes the only way to really get to known someone is to visit them in their home. Here, you can find a lot of clues to their true selves. So it is with companies as well. Polished marketing and great looking products can give you an impression of a large, professional, smoothly-running operation. But, as we can attest from direct experience, that simply is not always the case. And sometimes, as in the case of James Loudspeaker, you get surprised. James Loudspeaker (James) was founded in 1999 and led a bit of an inauspicious early life. Focused largely on high-end tower speakers, they struggled to penetrate an already competitive market. In 2003, new owners acquired the company – and that was the beginning of their next, and we would argue more exciting, chapter. The company first came onto our radar screen earlier this year, when we heard about a custom integrator who had a client that requested a loudspeaker system designed in a steampunk style. [See: It Was A Typical System Installation, Until the Client Asked for This…] Matt Durbahn of CDI Services in Denver, Colorado told us that when his customer made such a seemingly outlandish request, there was literally only one company he could turn to – James Loudspeaker. As this story unfolded, and we learned how James used their designers, engineers, woodworkers and even metal workers to create a design that never before existed…a complete one-off. We were blown away. Who are these crazy guys??? Nobody does that… And how does this make any sense at all for a manufacturer to custom design a one-off speaker design? James Loudspeaker is Mark Schafle (President), Mike Park (Chief Technology Officer), and Ted Telesky (Chief Marketing Officer). Oh and about 30 of their closest friends are there too. We had the opportunity to meet the management and get the “cooks tour” of the James Loudspeaker facility on a press junket arranged by the company earlier this month. The three principals are all ex-Harman employees, mostly from their JBL Pro division. We pressed them on their ownership – is James backed by venture capital or private equity? No, they told us firmly. Other than a few minority partners with a small piece of the action – Schafle, Park, and Telesky are the majority owners. Schafle also tells us the company has no debt. So with no equity or debt funding behind them – the owners are truly in control of their own destiny. We began our visit with a full tour of the James factory. This is one of two facilities used by the company, as there is another production unit in Mexico. It didn’t take long before it became obvious to us that this was one serious speaker company. Most speaker brands either go to China and buy off-the-shelf completed product, upon which they glue their own logo badge. Or they buy generally available speaker components – tweeters, midranges, woofers, crossovers, boxes, etc. – on the open market and stuff the boxes themselves. In the case of James, which has its own design and engineering team (led by Park), they own their own automated production equipment (such as CNC computer controlled production machines) and even, in many cases, design and manufacture their own speaker components. The ability to make their own boxes, speaker components, and crossovers gives them complete flexibility to design and build just about anything. 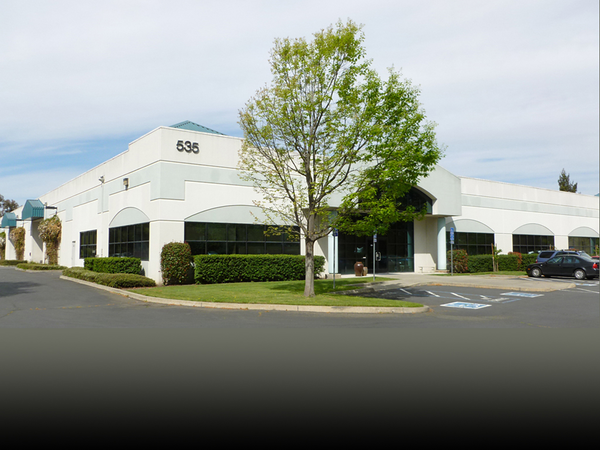 When you first arrive at James, the exterior is unremarkable…looking just like any typical office building. Walking through the door, you enter a rather sparse entry area with a reception desk to your immediate left. 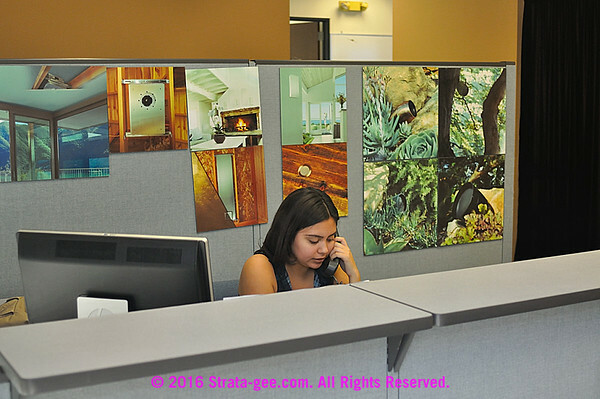 The reception desk is backed with several photos of different James Loudspeaker installations…varied in size and quite colorful. Our tour first took us past a room with tech benches lining two of the walls. Several technicians were busy testing circuits and working on their computers. It was not entirely clear just what exactly they were doing, but most of the circuit boards they were working on looked new to us – suggesting a new product testing regime. We then entered a fairly large warehouse area that was fixed with three levels of warehouse racks to stack inventory. As we walked around the warehouse, we saw incoming resource material (i.e. wood, aluminum, basic components, etc. ), partially finished goods, and freshly boxed finished speakers waiting to be shipped. The shelves appeared reasonably well-stocked. Schafle (pronounced shay’ full) picked up an aluminum speaker box apparently waiting to be stuffed with speakers and a crossover in a muted yellow finish. The company can finish any speaker in any color, he told the media present. Many customers send in swatches and the company is able to exactly match it…even in this not especially attractive washed-out, pale-yellow color. Particularly challenging, he went on, is when the company has to match tougher materials such as bricks or stone. These projects can take some trial-and-error to get right. However, no matter how long or how many iterations they have to go through to get the color exactly right – the company charges the same flat rate. Next stop on the Magical Mystery Tour was the powder coating area. We saw several raw boxes and aluminum outdoor speaker enclosures all neatly lined up waiting for their time in the makeup chair. The company has multiple rooms or enclosures where products can be powder coated. Actually, these enclosures are more like ovens, as powder coating is applied with a spray gun in a heated enclosure so that the finish is baked on. The powder molecules come out charged such a manner that they are in essence magnetically attracted to the item being finished for a perfectly even layer. After the first powder coat attaches to the item, the later particles won’t stick to them. 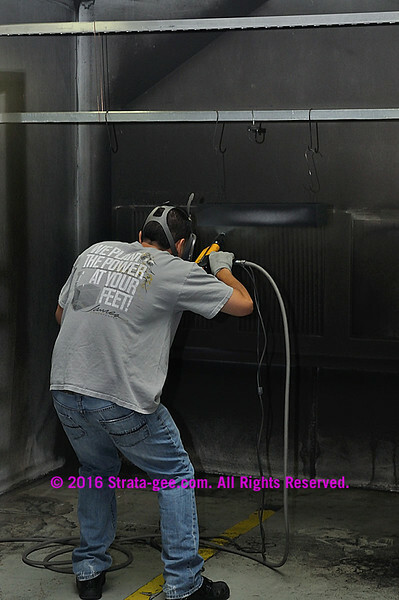 While we were there, an aluminum speaker box was hanging on thin hooks in a fairly large open area and an employee was carefully spraying on the powder coat in a rich black color. Actually, it looked kind of fun. Does a Soundbar Surprise You? Also waiting to be powder coated was an exceptionally large soundbar. Troy Ornealas, the Finishing Shop Manager, told us this was a custom soundbar created for one of the members of a certain mega pop group. Does it surprise you that a high-end speaker maker like James manufactures soundbars? Well, James makes a lot of custom-created products commissioned by integrators for their clients. Many of these products – with enough demand – end up in the regular James Loudspeakers catalog. Next we headed over to the wood and aluminum fabricating areas, where we met Fabrication Shop Manager Mark Schloesser. Schloesser was standing next to some interesting looking boxes. It turns out that these were actually a set of in-process speaker boxes destined to create another set of steampunk speakers – like those we told you about in April. The boxes have been built and they are awaiting the application of an incredibly unique finish and the components to be installed and connected. After seeing the finished first iteration of this remarkable model, it was kind of funny to see it naked. Schloesser showed us their automated CNC machine along with the pattern to be routed out of the wood as shown on the computer screen. The cuts are amazingly precise – which was demonstrated by dropping a speaker into its cutout…a perfect fit. The fabrication manager also showed us how the cut pieces of wood are simply folded up the be glued and otherwise attached in a perfectly seated and sealed manner. From here we saw the same type of computer automated system used make their aluminum enclosures. It was hard to not be impressed with the level of precision these machines are capable of producing. The company executives then escorted members of the press to the final assembly area. This was a large room with several rows of benches. About a half dozen workers were all busy assembling speakers in a room that seemed remarkably quiet. Some workers were screwing boxes together, others were stuffing electronics into a box, yet another was soldering wire onto a speaker component that was part of a larger speaker system. Racks along the wall contained what we presume to be the next items awaiting assembly. It was all very efficient looking. It seems the company’s growth is causing them to expand their final assembly area. To our eyes, it appeared to be about a 20% expansion of the space devoted to final assembly of James systems. From here, CTO Mike Park took us to another part of the building with a large open space to show us some of the products the company is working on. First up, an almost room-sized large outdoor structure – built kind of like a grown man’s tinker toy – that allows you to have a full Dolby Atmos or DTS:X or Auro 3D system outdoors. This all-aluminum enclosure was remarkable, built with open sides and ceiling to embrace the outdoor environment – with all speakers mounted in the “arms” and “legs” of the structure. Even the cables are run through the structure for a very clean installation. Park had an employee conduct a demonstration and we have to report that this system offered an impressive level of performance that we’re not used to experiencing from an outdoor AV system. This is not your typical garden speaker system! A Remodeled Listening Room – For Stereo? Park and Schafle also showed us a large rectangular aluminum rectangle that was used to surround a video matrix wall. The structure was a total of about eight feet tall and maybe twelve feet wide. The idea, they tell us, was to offer a higher level of audio performance than is typically accompanying a video wall. From the looks of it…this objective was achieved. 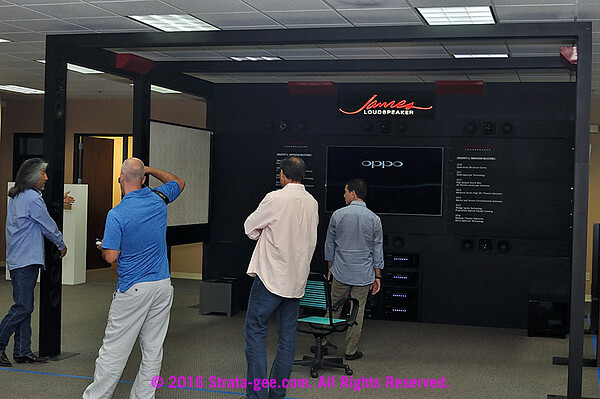 Then James’ CTO took us into a very well-equipped two-channel or stereo listening room. This room was stuffed with all sorts of equipment, including electronics from James and Bryston, and a wide variety of speakers that appeared to be mostly James. With stereo making a comeback, Park told us, it is imperative they audition systems in the same manner as they will be implemented. It is clear to us that James possesses more capabilities as a speaker manufacturer than we originally thought. The ability to build an entire system from the ground up gives them an edge over many other brands – including some with much greater market share. 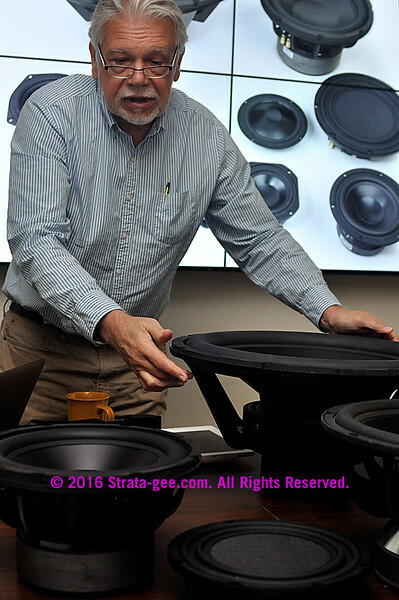 James’ standard product catalog carries more than 140 speaker systems. Their catalog is full of what they say are industry firsts – most notably the Power Pipe (hidden subwoofer) and Small Apererture series products. The company also has more than 25 custom-engineered speaker components and drivers that are only used in James’ products. Very few competitors overall – and we know of no others in the specialty segment – possess this level of capability. The company derives about 20% of their revenues from an endless stream of custom-created products – a business that they encourage. At most, other speaker companies offer a choice of alternate finishes. We know of no other speaker manufacturer that engages in James’ high volume, custom order production. The company is striving for a 1-day turnaround on custom speaker bar production. What?!?! What this means is that James Loudspeaker is a company that is constantly innovating. See more on James Loudspeakers at www.jamesloudspeaker.com. We’ll share more of what we learned about James and their strategy in a future article.